This last week has been a very hefty week, climaxing on Thursday for my first two (of three) Christmas concerts at ICS. God answered so many requests concerning these concerts that I wanted to write and tell you about them and say thank you for supporting me with your prayers!! 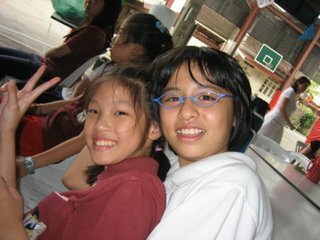 The first was the Elementary Christmas concert at the Prong Jai campus. I don't think I've written about Prong Jai yet on my blog or ever posted all the pictures I meant to post, but it is the smaller, downtown campus that I travel to once a week to teach music. 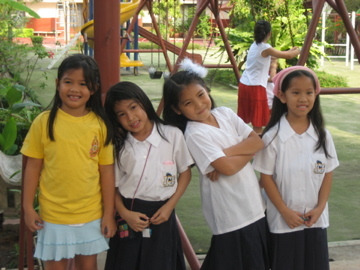 Prong Jai was the original campus of ICS where Elementary and Secondary students attended until the school way out-grew it and built the much larger Bangna campus 2 years ago. Now there are only 65 K-5th Grade students there and after much prayer and many meetings of the administration and school board this past fall, it was decided that Prong Jai will be closed after this year. Even though I've only taught there now one semester and am only there one day a week, I was very sad about this decision. I love Prong Jai. Because there are so few students there, the campus really has a "homey" feel and the students and faculty are like one big family. The teachers there work together so well and I really enjoy being with them and fellowshipping with them. And the campus itself is very beautiful (I'll post the pictures soon), with a beautiful garden/play-ground in the center of campus. It's also very peaceful there, even though it is in the middle of town. I love my Thursdays because I get to travel out to Prong Jai to teach. Prong Jai does not have an auditorium or classroom large enough for a concert, so our Christmas concert was on platforms they set up in the outdoor cafeteria. We had it first thing in the morning (7:30) because by 8:30 or later, it would have been too hot to be enjoyable! 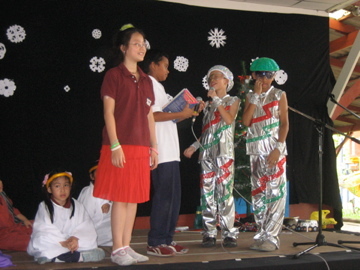 The kids did a combination of songs from a collection called "The Signs of Christmas" and a play called "Green at Christmas" which we edited to make our own and is about 2 aliens that are trying to figure out the meaning of Christmas (it ended up very funny and cute!). The kids did fabulously and sang out so well and really seemed to enjoy it. We all worked them very hard with extra rehearsals, but they pulled it off wonderfully. I was so proud! In fact, so few things went wrong that by the middle of the program, I wondered what was going happen because some big mishap has to happen at every concert, right? We had one sound glich and that was it. One exciting thing about this concert was that because I am only there once a week, putting it together was really a team effort of the teachers and staff. And they all gave so freely and worked as hard as I did on this concert. It was neat to see everyone's gifts being used on behalf of the children. 1) a conversation I had with one of my second grade Indian students before the concert. I was praying and reading my Bible alone in the music room before the concert and Dhavani came in a sat down and started talking to me (made me miss Rachel Mitts a lot!). After a minute she looked at the open Bible on my lap and asked, "Will you tell me something from the Bible about God?" I think my mouth must have dropped to the floor as my mind raced, thinking "Where do I start?!" She must have known what I was thinking because she said, "Tell me what you were reading." So I read her some of Psalm 113, sharing about the greatness and yet condescension of Christ, relating it all to Christmas and the gospel. Before I knew it, she was sharing the gospel right back to me (Dhavani has and has had excellent teachers at ICS the last couple of years!). Later she said, "I want to go to the Promised Land." I agreed with her and said that one thing I was really looking forward to was seeing people from all different nations (India, Thailand, America...) all worshipping God there together. She asked if there were going to be many Indians in heaven but when I said that I thought so, she got really sad and told me that she keeps telling her Hindu family that Jesus is the Way and Truth but that they just won't believe. I prayed for her family with her. Later when I told my good friend Amber about our conversation (Amber was Dhavani's teacher last year), she said that Dhavani's parents almost didn't let her and her brother come back to ICS this year because they were/are so opposed to Christianity. What a difficult thing for a young child and young believer to deal with! Please pray that God will sustain and grow Dhavani's faith and that her parent's eyes will be opened to the truth of the gospel! 2) God answered my prayers that the gospel message would be central to our concert and would be proclaimed clearly. With the ESL student actors, some of the lines in the script couldn't be understood so very well and many of the jokes of the play were sadly lost to our also largely ESL audience, but God answered my prayer that the students would remember and speak clearly those lines that were especially speaking of the meaning of Christmas. He guarded the climax of the musical - when the 5th graders were refuting all the misconceptions about Christmas and boldly sharing that Jesus coming to save us was the real point of Christmas - from feedback from the mics or outward distractions and it led beautifully to one Christian student (Fa - who has the most golden, selfless heart of any 3rd grade boy I've ever known!) singing the solo "Christmas isn't Christmas (til it happens in your heart)." My eyes filled with tears of amazement and joy as I watched the kids share this message with their (mostly) unbelieving parents and then again at the end when the whole student body sang out "Lord, we lift up Your name, with hearts full of praise! Be exalted, O Lord my God - Hosanna in the Highest!" Yes, Lord! Come and save! 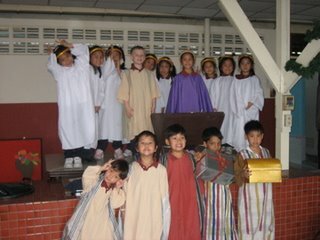 And be exalted in Thailand from the mouths of these young ones!! "Where, oh where, is our tour guide?"